One of Lily’s most favourite things to do is roll around on the floor, sometimes because she’s so robust she gets stuck, kind of like a turtle! 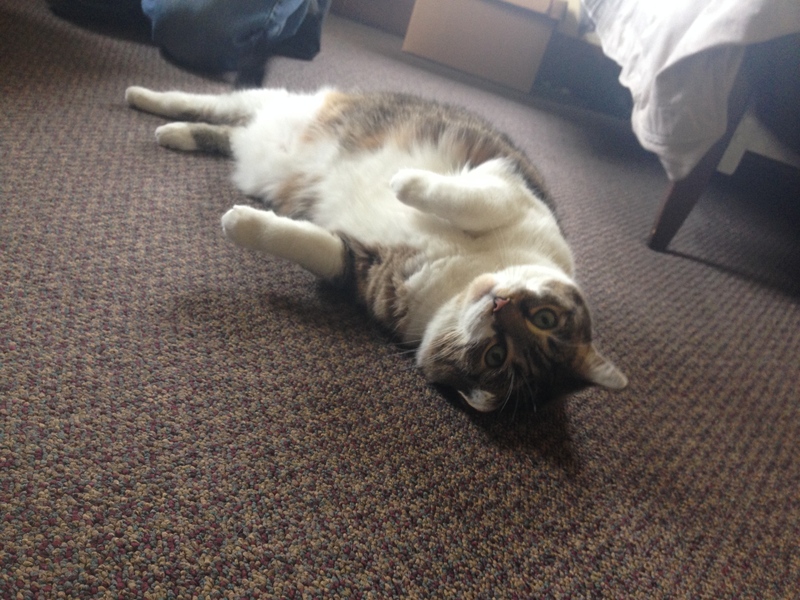 Lily is a wonderfully sassy, incredibly chatty feline who lives with Dr. Watson and her family. Lily came to the Watson’s in the spring of 2015 after she was no longer able to live with an elderly family member. She’s currently on a weight loss mission and is coping with some mobility concerns that come secondary to her increased body weight. She’s not about to let her physical challenges get her down though! She is an optimistic, chatty, happy-go-lucky cat who’s current favourite activites are supervising the activity of the dogs while they’re outside from her favourite bedroom window, monitoring the clock and informing her humans of mealtime and chirping and chatting away whenever she feels it’s appropriate (which is most of the time!). She is currently adjusting to life in the country alongside two other cats (Hawkeye and Troutie) as well as two big dogs (Radar and Blue) – quite a change from a small, quiet apartment in the city! Lily ALWAYS has something to say, so the team at O’Sullivan Animal Hospital has drafted her to spear-head their hospital blog – providing (hopefully!) useful information about common pet care issues as well as a creative outlet for Lily’s charismatic personality.